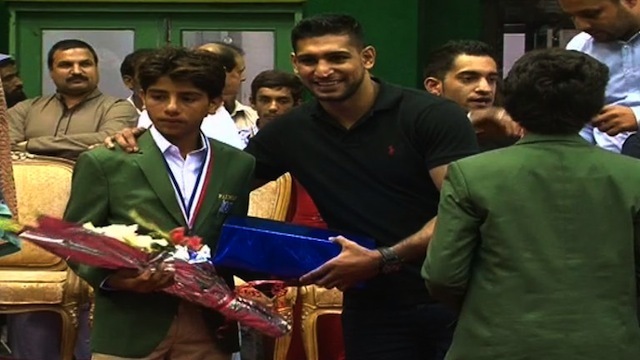 ISLAMABAD: World silver welterweight champion and Olympic silver-medalist British boxer of Pakistani origin, Amir Khan on Friday formally opened a Boxing Academy in Islamabad Friday, expressing confidence that it will produce champions of his own caliber. The "Amir Khan Boxing Aademy" has been established here at Pakistan Sports Complex in collaboration with Pakistan Sports Board (PSB), to train young pugilists of the country. A Memorandum of Understanding (MoU) was signed between Amir Khan and Director General PSB Akhtar Nawaz Ganjera at Rodham Hall for imparting training and grooming aspiring boxers on the native soil of Briton's family. Secretary Ministry of Inter Provincial Coordination (IPC) Ejaz Chauhry was also present on the occasion. Amir is the World silver welterweight champion right now after turning Pro in 2004 when he clinched silver medal in the Athens Olympics. Under the agreement Khan would provide coaches and boxing equipment for the Academy, while PSB would extend all necessary support to run it in an efficient way. "The reason I get involved in boxing in Pakistan is that it has great talent for sports and that needs to be shown. Pakistan is a great country I really believe we can make several champions in this sport," he said talking to media after signing MoU. He said that he was proud to be in Pakistan and work for the cause of improving boxing. He said boxing had changed his life and believed that whatever he was today was due to boxing. "I started boxing when I was just a kid of eight years. If I were not a boxer I would not have been here today." Khan believed that Pakistan could be a top nation in boxing. "My dream has been to help Pakistan in sports. And being a boxer myself I decided to extend support in boxing," he said. "This will not be the only academy in Pakistan as we are going to have many more," he said while hinting that he might open next academy either in Karachi or Quetta. He said he would keep on visiting Pakistan time to time and ensure his own availability for providing training and advising young pugilists. Khan sounded optimistic that the Amir Khan Boxing would soon yielding results. "Once the academy begins working it will produce champions within twelve months." Speaking on the occasion, Ejaz Chaudhry said that Amir Khan was a hero of Pakistani nation. He said that establishment of Amir Khan Academy was a great achievement and assured all-out cooperation for running the academy.